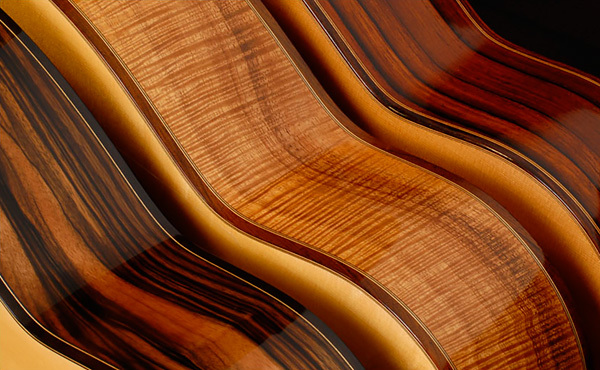 The tonewoods used in the creation of an acoustic guitar are critical to how it sounds, as the instrument’s top, back and sides have the greatest overall effect on tone. The top is the soundboard that pumps air into a resonance chamber formed by the back and sides. “With tops, density and weight are particularly significant, while the weight-to-strength ratio, as well as the shape, are important regarding the reflective back and sides,” explains Santa Cruz Guitar Company founder Richard Hoover. We visited Hoover at his shop, where he was down to play a game: I named popular tonewoods from the list of available options, and he provided the following descriptions.